Western Bottle News: Star Remedies Co.
For the 30 years that I have collected western medicines, there have been a few mysterious brands which seem to have little or no advertising or evidence to really pin down details of these amazing pieces of glass. 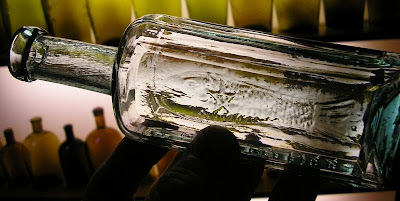 The brand names alone are enough to stir interest to collectors, and the rare Trout Oil Liniment with it's embossed carp-like trout is one that has captured my attention. It is one of the very few embossed early western medicines with a picture. The theories abound on this bottle, and after a lot of searching, there are more pieces added to the puzzle. I found an ad in the Virginia Evening Chronicle dated from August 8th, 13th, and 16th. 1877 which not only identifies the Trout Oil Liniment as being made from Lake Tahoe trout, but also sheds some light on it's cousin..."Remedy #1". The Trout Oil is embossed "Remedy #2", and I always wondered what "Remedy #1" would have been. According to the ad, the "Dr. Van Dyke's Antibilious Cure" is also from the same company, and it so happens to have "Remedy #1" embossed on the front panel. At long last these two bottles can not only be confirmed as 100% western, but that they are connected in a series makes me wonder if there is a "Remedy #3"! Both of these medicines are extremely rare with about 6-8 Trout Oil Liniment examples known, and one or two Dr. VanDyke's Antibilious Cure's in collections that I know of.It is still unknown as to whether these are a Nevada brand, or California...the ONLY ads I have ever found have been in Virginia City. Nevada papers. I think western medicines are very under-valued at this time, and for pure history, they are tough to beat! If anyone else has information on the "Star Remedies Co.", please share it. Beautiful western bottle Dale and a good job of researching and putting the puzzle pieces together.I missed the Van Dykes by a whisker thanks to a portly Bay Area collector that jumped in the middle of the deal. That bugs me to no end. Portly, eh? HAR! I have no clue about "Star Remedies Co", either. Very cool set ! On the meds, I think there are still quite a few yet to be discovered... Keep diggin ! !